I am an early riser. I like getting a good start to the day. I skip that trip to the kitchen for a cup of coffee and head outside. Yup, the first thing I do is grab my dog and go out for a walk. I just love starting my day by going outside and breathing fresh air! If you read this site you know that I travel… a lot… but that never stops my walks. I walk for about 30 minutes. When I get home I drink a tall glass of room temperature water and I make myself a nice breakfast. Today was my Oatmeal Quinoa Blend made with coconut milk topped with bananas almonds, and cinnamon. More on that in a minute! Then I shower and lastly I open my computer and say hello to all you wonderful people 🙂 Not too intense, I’m sure some do it better, but that’s my morning for you. 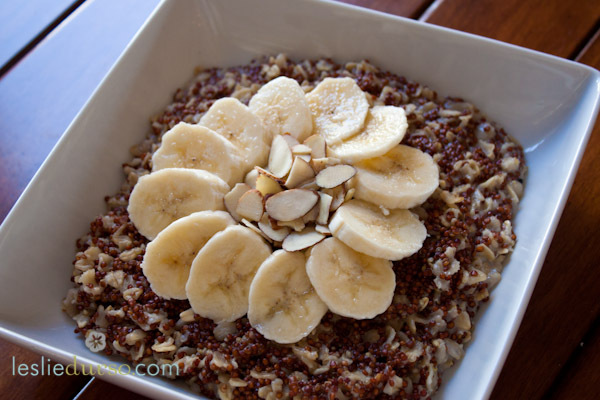 Ok, more about that Quinoa Breakfast Blend! Quinoa is a great way to start you day because of the high protein and fiber, but I don’t like it on it’s own in the morning, so I started blending it with my oatmeal and then I had the epiphany to cook it in coconut milk and now nothing else will do! (that’s not true, I use almond milk when I don’t have it lol!) Give it a try and let me know what you think! I’m giving you the recipe for a 50/50 blend, but if you are unsure about having quinoa for breakfast, adjust so there is a little less and a little more oatmeal. This fabulous hearty breakfast is ready in 15 minutes! sliced banana, blueberries, raspberries, strawberries, peaches, shredded coconut, your favorite dried fruit etc. toasted nuts like almonds, granola, non-dairy yoghurt etc. Place the quinoa and coconut milk in a small pot and bring to a gentle boil, immediately reduce the heat to medium and let simmer for 10 minutes. Add in the oatmeal, stir, and let simmer another 5 minutes. Pour in bowls and top with fruits, nuts, and cinnamon.